Andhara Early one Indonesian Artist send testimonial picture with our product. Thank you to Andhara Early for the photo. It’s mean a lot for us. When I visited Kamakura home of the big Buddha, I saw loads of people walking around with shopping bags with the design on the front of the Hato Sable (pigeon/dove cookies). I didn’t understand why they were so popular, and I wasn’t planning on finding out at that time. I was in Kamakura, for Pete’s sake! I was going to try something traditional food, not what looked like a Western-style butter cookie! Of course, my dedication to all things Japanese on a trip to the land of the giant Buddha would have seemed a bit less hypocritical if my husband and I hadn’t gone to an authentic German restaurant by the sea ran by two authentic German people (the food was great, incidentally). The web site for these cookies says that the hato sable was “born” in Kamakura, so I guess that is why they were sold in abundance there. However, you can get them at many outlets around Tokyo as well as order them online. A box of 10 large cookies is 1050 yen . When I say “large”, I mean that these cookies wouldn’t be out of place in an American bakery. They’re jumbo by Japanese standards, but then I guess miniature pigeons wouldn’t really do now, would they? 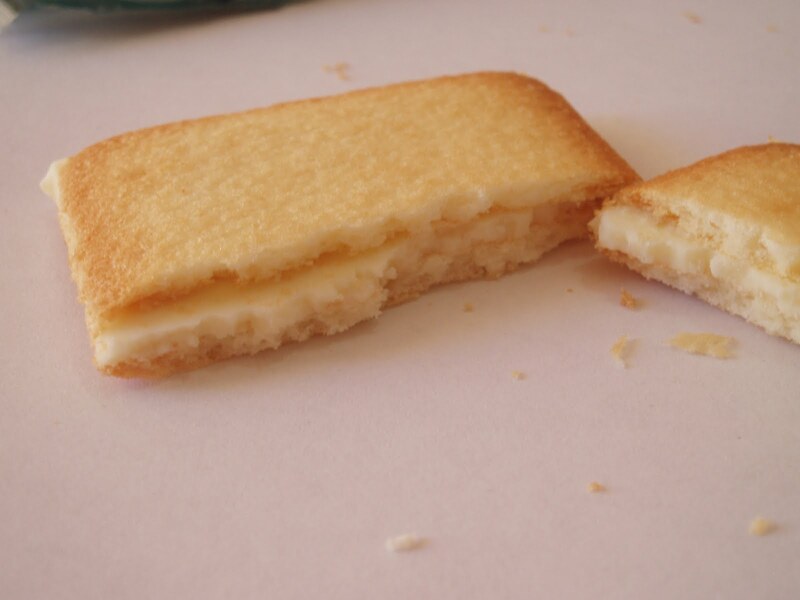 “Sable” means “sandy” and it is used in French to mean a cookie crispy, sugary, tender, and maybe even a little salty. These were introduced in the Meiji era in Japan when European culture was being welcomed with open arms by the Emperor. The ingredients list is very simple: flour, sugar, butter, eggs, and baking powder. There is nothing surprising in there, but the result is a perfectly crispy cookie with a rich buttery flavor and an amazing texture. They are neither too sweet nor too bland and have a very fine sense that separates them from commercially available butter cookies such as those that are sold in shelf stable packaging in markets. 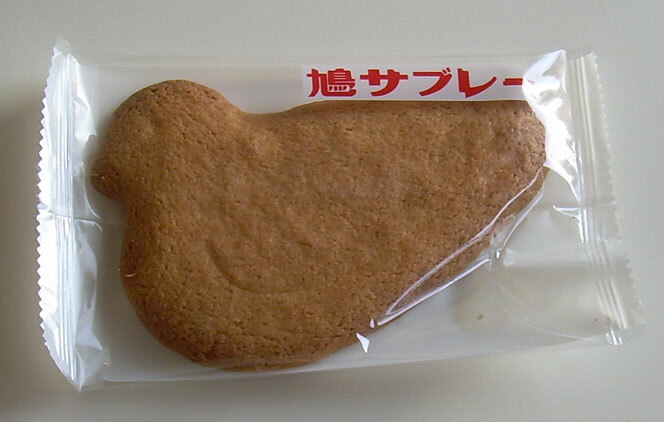 I’ve been told that these cookies are extremely popular in Japan (especially as of the time I’m writing this). I’m not sure why after so many years of making them that they should be more popular now than ever. Maybe it’s marketing and ramping up their distribution such that they are more readily available outside of Kamakura. Perhaps it’s more complicated than that and people crave something simple yet high quality that carries a sense of richness in times of prolonged hard times. All I can say is that these are very well-made cookies that are not terribly expensive. If you see the distinctive bird design on the sunny yellow box, buy them and enjoy one with a cup of tea or coffee. Unless you’re the type of person who needs heaping helpings of sugar in your sweets, there’s every chance you’re going to really appreciate these. 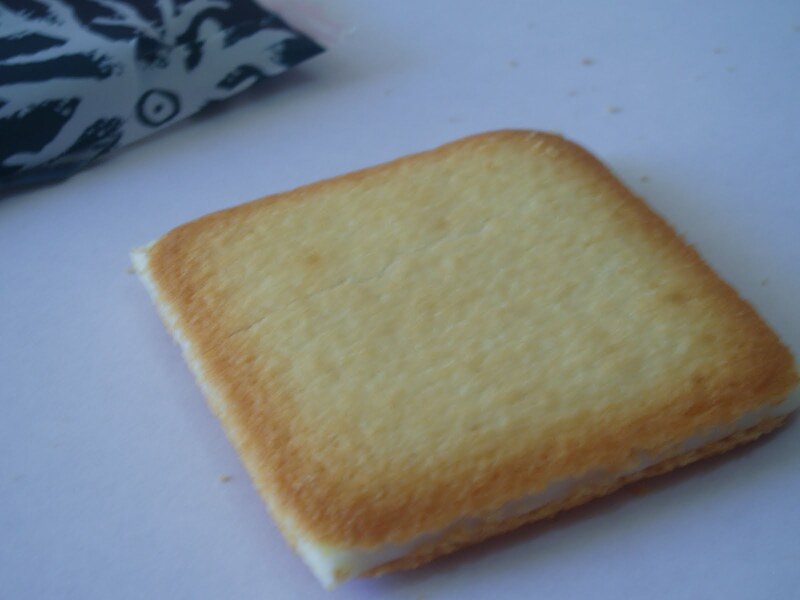 Shiroi Koibito is a premium sandwich cookie made in Hokkaido. 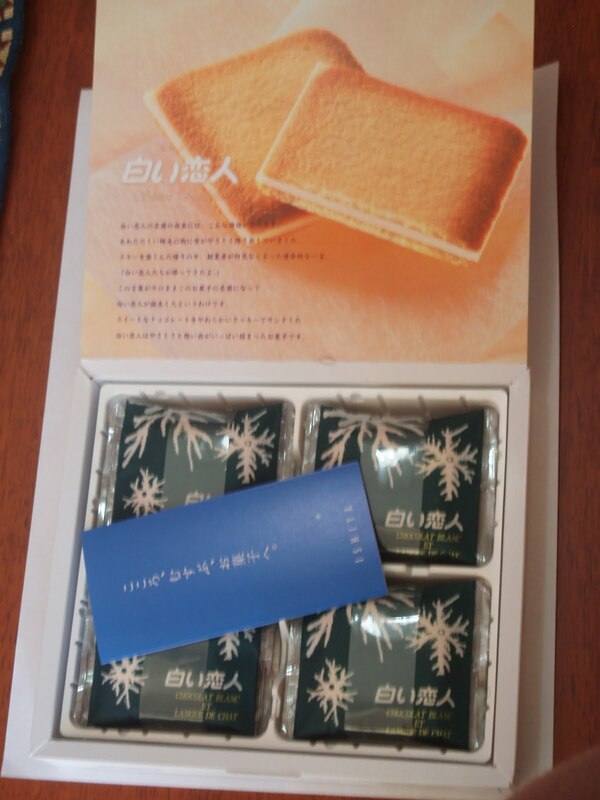 It’s usually given as a present to co-workers, friends and family on return from Hokkaido. These days with the invention of the internet, you can simply go to their online shop if you live in Japan and get it delivered to you, rather than going all the way to Hokkaido. It is also available at airports nationwide, I saw it in Nagoya airport along with the Shiroi Koibito drink which I will expand upon at the bottom. I’ve never actually bought it anywhere other than Hokkaido, I think it tastes better that way. I know when I’m in Hokkaido I’m home, so for me this is the taste of home. The boxes come in a manner of different sizes, this here is the smallest one, for 12 individually wrapped pieces. When I came home from Japan I bought a suitcase full of unique candies including Shiroi Koibito, and from the store I bought some paper bags. I then filled up the bags with the candy and one each of the Shiroi Koibito. They were very much a hit and for weeks on end we had Yasu’s co-workers asking us where they could get some more of this whitey goodness! They didn’t realise we still had one small box stashed away in our cupboard for ourselves, and we weren’t willing to share! 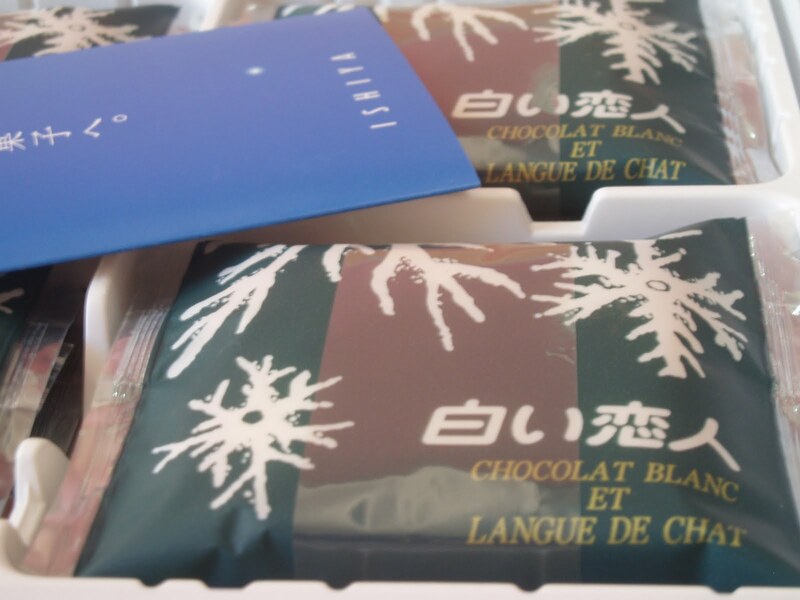 “Chocolate blanc et langue de chat”. Googling that I found that it means “Chocolate and white cats tongue”. The actual name of the cookie means “white lover”. I guess Hokkaido could be known as my white lover anytime! 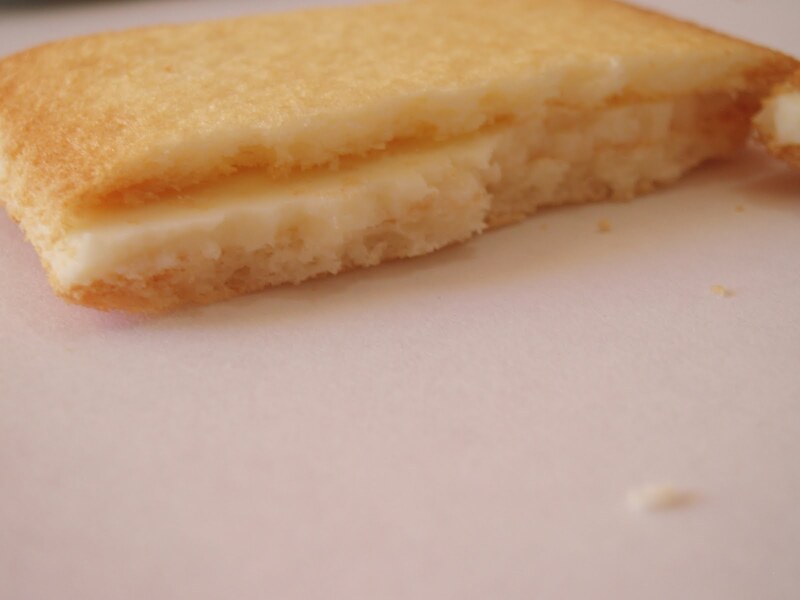 The cookie is 5cm x 5cm in diameter, is slightly rounded with the white filling poking out the corners. The cookie is golden and has a slightly more golden colour around the edges. It’s quite crumbly and breaking it in half means that a thousand crumbs fall off the edges. The filling is a thin layer of white creamy chocolate that just melts in my mouth, and is beautiful white chocolate in a demure way. The cookie itself, despite using shortening has a really nice texture and has a slight taste of coconut. It’s not oily or dry, its just right. They use cocoa butter, cocoa powder and milk from Akayama (the maker’s home town) to come up with a cookie I can’t ever resist, no matter how many times I have it. 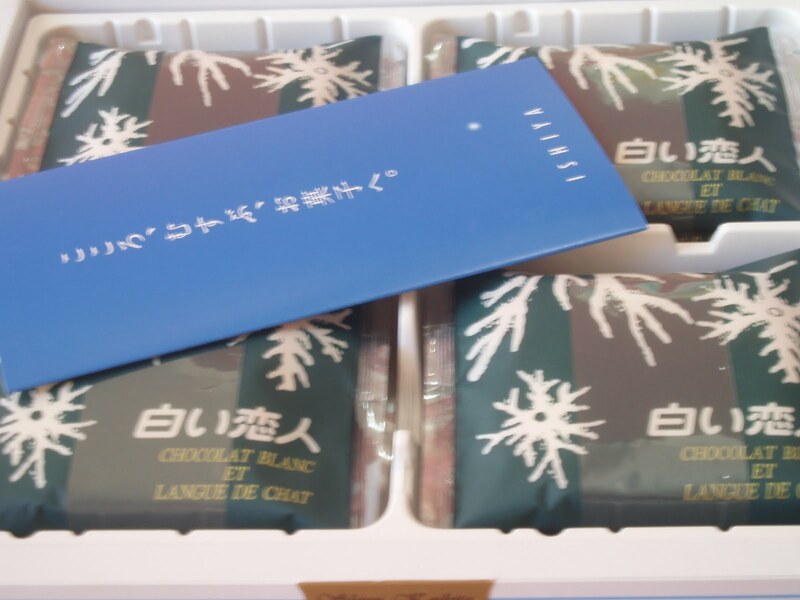 Yasu is quite the slave to Shiroi Koibito, and I have to hide it in the cupboard otherwise he would eat the whole box in one sitting and wouldn’t save any for me!! Despite the fact that he’s from Hokkaido and had it countless times when he lived there. Ishiya have realised that when you do something you should do it well, and they have. It’s been a stayer in the market for 30 years and still going strong. TOKYO BANANA~ DELICIOUS JAPANESE SNACK! Edisi kali ini saia mau ngebahas snack enak dari Jepang. Kalau menurut saya si enak banget, tapi ada temen yang ga suka katanya rasanya aneh (-__-)’ well, selera orang beda-beda. Tokyo banana adalah semacam kue sponge yang didalamnya berisi cream pisang. Kalau di Indonesia mungkin namanya kue bolu pisang. Tokyo banana ada berbagai macam rasa (selain rasa original) & isi cream nya pun bermacam-macam (caramel, choco,strawberry,dll). Tokyo banana merupakan snack yang cocok dijadikan oleh-oleh bagi para turis yang berkunjung ke Jepang. Selain rasa-rasa diatas masih ada lagi rasa & bentuk Tokyo banana yang lain. This is a divine mist which has hints of plum, apple and fruity smell. The packaging itself is real beautiful which comes in a dark blue spray bottle. It shows you the quantity of the mist, how much is used and when to go for a new one. The nozzle is perfect that it gives the exact spray when you use it. The best thing about this fragrance mist is just one drop of the mist brings out the wonderful scent and it spreads like a mild enchanting fragrance. The fragrance is not overpowering and the mildness will sure attract you lot of admirers. The next important point to discuss will be the staying power. The smell lingers on your skin for good 4-5 hours. The best powerful fragrance will be there for 3 hours then it will be the mild lingering one which will be more wonderful. The mist is safe and does not cause any side effects on the skin. I use this on hands and even spray on clothes for additional fragrance and it’s really awesome. You don’t have to worry about spraying on clothes as it does not give that white patch or any stain on the clothes. It also has aloe in it to nourish the skin so not to worry for skin problems a lot. With all these you can remain the most wonderful flower fragrance princess. • Staying power is awesome. Stays for 4-5 hours.